The CoffeeShop Blog: CoffeeShop Vintage Damask Frame 2! CoffeeShop Vintage Damask Frame 2! Guess what! I finally decided to spend the $10/year to buy my domain name through Blogger. Back when I started this blog I thought I would call it Coffee, Tea, Photography!, but I decided after a while that the name was too long and cutsie. And of course I was too busy (lazy) to do anything about it. Well, today I sat down and registered as The CoffeeShop Blog! New name, but the same old blog. ;-) It is so much easier to type in www.thecoffeeshopblog.com rather than www.coffeeteaphotography.blogspot.com . Welcome to my new old blog! I hope everyone is having a great weekend! The weather here has been perfect and we have spent most of the weekend outside. I love Autumn. By the way, our little puppy Maple is growing like a weed and is already over 20 pounds! She is so adorable and has been the perfect addition to our family. I want to mention that she is an outside dog, thank goodness! Everyone loves her, except Fatso Catso. He is really grouchy because not only has he been on a diet for months, but he feels that his yard's peace and sanctity has been ruined. He refuses to give in to Maple and if she looks at him the wrong way his paw comes out swinging. I wanted to post my second Vintage Damask Frame (you can download the first one here). 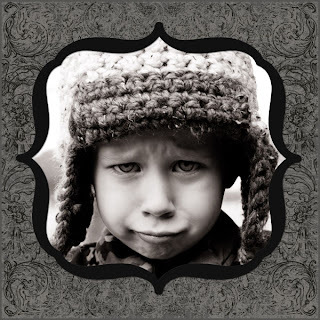 Like the Vintage Damask Frame 1, you can completely adjust the colors and amount of design and texture by clicking on the layers because this is a layered .psd file for Photoshop or Photoshop Elements. Open it like any other image and use the clipping mask to add the images. I made a black/gray version below to show you how different the frame can looks with a few changes. 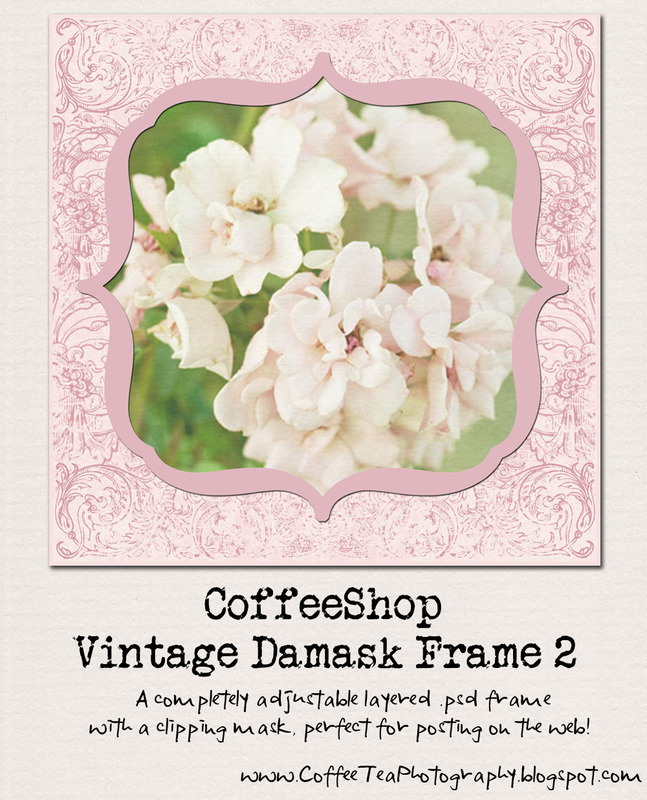 You can download the free CoffeeShop Vintage Damask Frame 2 HERE! Lovely, as always. Thank you!! Congrats on the new domain name:). So cute! Thanks so much for your wonderful resources! Congratulations on owning your own domain!! I bought my own domain months ago and I still don't know what to do with it! Maybe you will type a tutorial for us!